Lawrence County is literally bursting with fireworks this summer. So far I’ve watched fireworks at New Castle’s Italian Festival, Pearson Park 4th of July Celebration and Western PA Balloon Quest. Those were just three opportunities for me to watch the “Fireworks Capital of America” in action. Each show was packed with spectators, streets were lined with parked cars, lawn chairs were set up in yards and families were lounging on blankets. Everyone’s attention was turned to the night sky, waiting to see bursts of color illuminate the darkness. This time of year, the Fourth of July especially, wouldn’t be the same without the haze from the neighborhood firework displays, sparklers and the distinct smell of sulfur. It’s hometown Americana and oddly comforting to me. 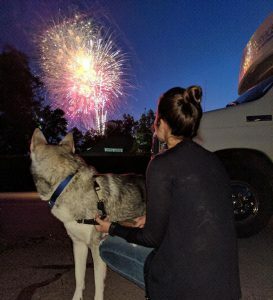 Funny enough my love for fireworks has rubbed off on my dog, Django. Every time he hears the initial “boom,” he runs to the window to catch a glimpse. 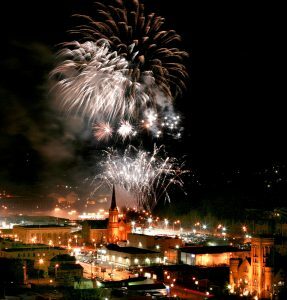 Two nationally recognized companies are credited with making New Castle, PA the “Fireworks Capital of America” – Zambelli Fireworks and Pyrotecnico. Both got their start during the mid 1800’s in Lawrence County which was once the largest producer of fireworks in the world. A fireworks retailer, Sky King Fireworks, is also located in the community. Let’s go back a few hundred years to fully understand how we became the Fireworks Capital of America. The Chinese are generally credited with the invention of explosive chemicals and their use in the making of fireworks -officially termed Pyrotechny. It was not until the turn of the century, however, that the art of manufacturing fireworks was brought to New Castle, Pennsylvania. Leopoldo Fazzoni came to New Castle in 1886 when he was 18 and worked in a mill until 1897 when he finally had enough money saved to open his own fireworks company. Others who worked with Fazzoni before starting their own companies were Jacob Conti, Paul Rozzi and Constantino Vitale. 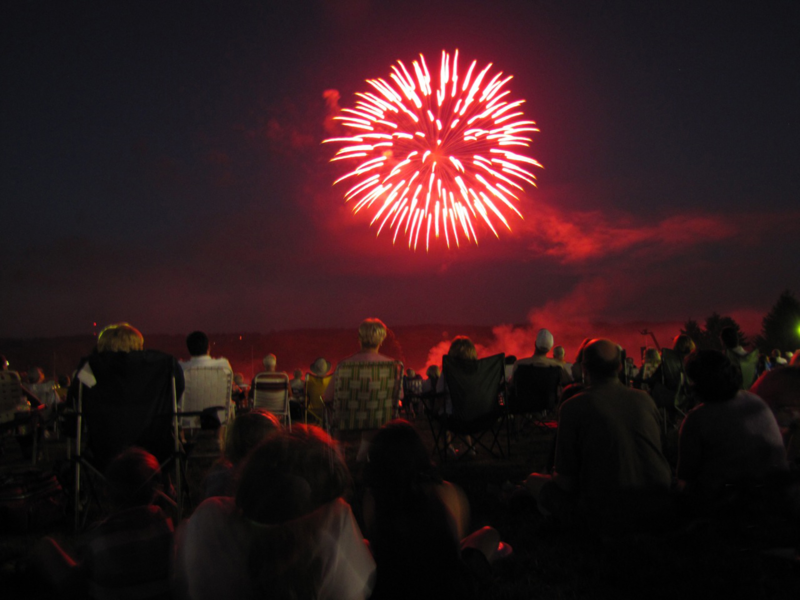 During the 1920’s there were more fireworks manufactured in Lawrence County than anywhere in the United States. Many pyro technicians made their home in New Castle because the climate and hills reminded them of their original home in Italy. Four years prior, Fireworker Antonio Zambelli ventured from Italy in 1893 with the family’s secret firework recipe to establish the Zambelli Fireworks Manufacturing Company in New Castle, Pennsylvania. 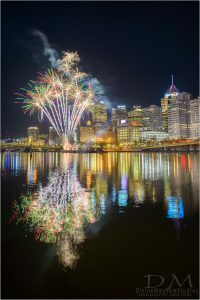 Proudly known as the “First Family of Fireworks,” Zambelli is one of the oldest and largest fireworks companies in America. In the late 1940s, George Zambelli became the owner of Fazzoni Fireworks. 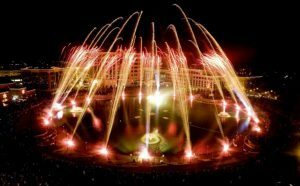 The magic of Zambelli pyrotechnics has been televised around the world on “MSNBC Investigates”, the Odyssey Network, the Discovery Channel, The Learning Channel and the British Broadcasting Company. 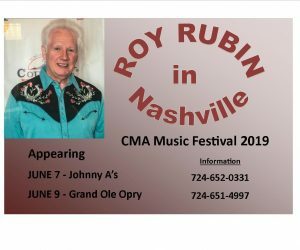 They have shot off fireworks for the 1986 Statue of Liberty celebration, multiple president inaugurations, Desert Storm troop return, the Pope in Toronto, Elvis Presley stamp unveiling, Yves St. Laurent perfume launch, White House concerts, MLB, NFL and so much more. Coincidentally they have done President Nixon’s “Honor America Day” where Bob Hope starred. They even have a spot in the Guinness Book of World Records for igniting fireworks at the highest altitude which happened to be Pittsburgh’s U.S. Steel Building. Before, after & with Fazzoni, Constantino Vitale and his memory have been amplifying excitement since 1889, which is now known as Pyrotecnico, quickly became one of America’s premier fireworks manufacturers. Now this 100-year tradition and art have been enhanced with innovations of the new generation of the Vitale family. Producing over 2,000 displays this past year, Pyrotecnico is one of America’s largest and fastest growing fireworks companies. Over the years they have been wowing audiences with pyrotechnics at multiple NFL, MLB, NBA games; box office hits like Transformers: Age of Extinction and Love and Other Drugs; commercials; festivals like the National Cherry Blossom Festival and Pyro Fest, touring with musicians like The Wkend and Zedd and much more. “Fireworks Capital of America” was officially trademarked in 2006. August 5: St. Vitus Festival – Baby Doll dance Aug 3rd at 9pm and FIREWORKS by Pyrotecnico Aug. 5th at 10:30pm. If you were unable to watch the magic at Westminster College Independence Day Celebration, click here to see a drone view. In addition, the Lawrence County Historical Society has a small exhibit of fireworks memorabilia donated by the late Dennis Manochio, a former museum curator. Visit Lawrence County is working with local businesses to bring a year round fireworks museum – stay tuned! Lastly, Zambelli Plaza, located in downtown New Castle, was built in honor of the Zambelli Family. Smiling as I was getting ready to conclude my fun and memorable Fourth of July weekend, I drove home seeing the sky light up with neighborhood fireworks. I saw kids watching from their front stoop as their entire block turned into a spectacular show. My mind then went back to cheering for the New Castle football team and seeing fireworks that would follow each touchdown and add to the excitement. Yep, this is my hometown and I love everything it has to offer. 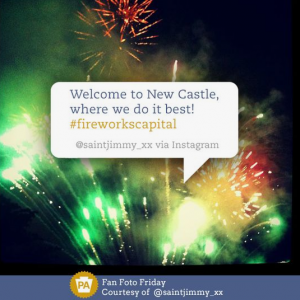 There will never be another “Fireworks Capital of America” because New Castle is fireworks. This entry was posted in Recent News & Updates and tagged Fireworks. Bookmark the permalink.